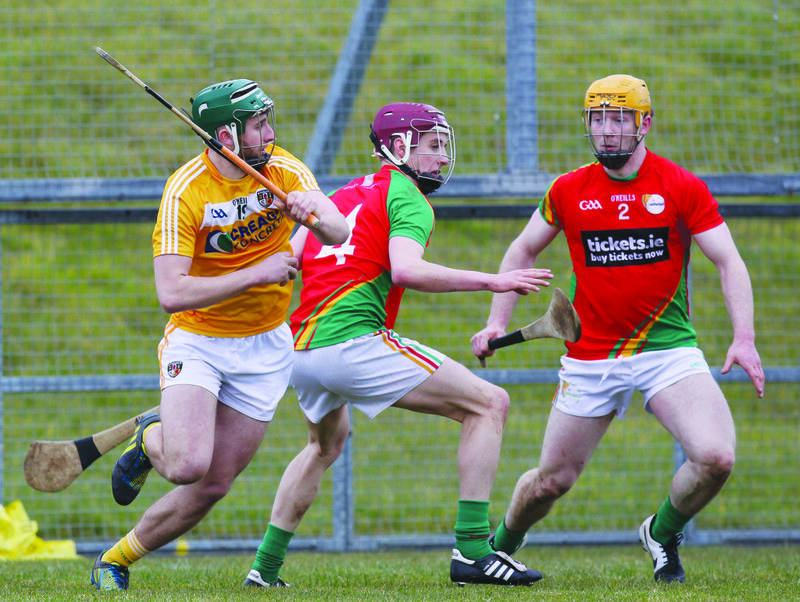 REVERSING the recent trend against Carlow is the mission for Antrim’s hurlers when the Saffrons travel to Netwatch Cullen Park for their second National Hurling League 2A game this Sunday. The Barrowsiders have enjoyed victories in the last two meetings between the sides. In last year’s NHL 2A, the Leinster side came away from Ballycastle with a 1-17 to 1-11 to end Antrim’s hopes of promotion and the previous year, they relegated the Saffrons from the MacCarthy Cup with a 2-18 to 1-11 win in Carlow so will certainly be full of confidence they can make it three victories in-a-row over Antrim this Sunday. Last weekend, Colm Bonnar’s side opened their 2A campaign with an impressive 1-13 to 1-11 win against Westmeath on the road so will feel that a win on Sunday can leave them with one foot in the 2A decider with games against Armagh, Kildare and London to come. As usual, they will be led by the influential Marty Kavanagh who captain’s the side while Paul Coady will punish any indiscretions from placed balls. Perhaps the most pleasing aspect of their win last week was the ability to spring Seamus Murphy – who bagged the goal – Diarmuid Byrne and Denis Murphy from the bench although James Doyle remains a doubt with a broken nose. Antrim are forewarned for the trip south, but they too will go in off the back of an opening day win although it was only in the 25 minutes after half-time when they pulled away from London. There are no illusions surrounding the size of the task this Sunday, but Antrim joint-manager, Dominic McKinley believes his side can go with confidence. “We know what we need to do so we need to go there and do it,” he said following Antrim’s seven-point win over The Exiles last weekend. “We are in a good position so we will think about that game during the week. Antrim will be without Neil McManus who continues to recover from a broken cheekbone sustained in the challenge game against Tipperary three weeks ago, but there was good news against London with Neal McAuley coming on for the last couple of minutes and could play a greater role on Sunday while McKinley reports there are others who could come in. For a number of years, Antrim seemed to be something of a bogey team for Carlow who came close of several occasions in League and Championship before being caught at the last, but the last two results means it is Antrim who are now playing catch-up insists McKinley who views Carlow as being where Antrim should be aspiring to for now. He also feels that a defeat – while not the end of the world – would leave Antrim in a precarious position going into their final three games. “These are the barriers you have to get over,” he continued. “We have to try and catch them. We aren’t trying to catch the Kilkennys and Tipperarys at the minute. We go there next week knowing it’s one of those games. Casement Social Club is running a bus to Sunday’s National Hurling League 2A game between Antrim and Carlow at Netwatch Cullen Park. The bus departs from Casement at 9am and will leave Carlow at 4.15pm. Tickets are £20 and include a free drink in Casement Social Club upon return. Tickets are available from Casement Social Club or contact Joe Compston (07719952072).